WRIC Editor’s Note: This girl is not an orphan. Her mother has been looking for her for 17 spring, summer, autumn and winter. 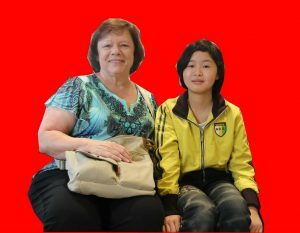 Dear reader, Do you have any information about her and the adoptive family? Please contact Women’s Rights in China. We only know that they live in Arkansas. My name is Shen, Xiaodong(申晓东) and here is the story of how I lost my daughter Shen, Haiyue (申海月). I met my daughter’s father Meng, Guangten(蒙冠腾) after his divorce with his ex wife in 1998. We quickly fell in love and moved in together. 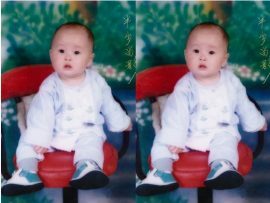 We had our daughter Shen Haiyue(申海月) in 2001. My relationship started to get bitter with Meng, Guangten and we had frequent arguments over little things. 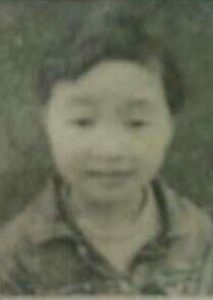 Shen, Haiyue (申海月) in Children’s Welfare Institute in Guiyang City. The photos were from the adoption family of Shen, Haiyue and are released by the welfare home. Finally in April 2003, We had a big fight. Out of anger, Meng, Guangten took our daughter went to the police station. He made up a ridiculous lie that a strange women on the street asked him to hold the baby so she could go fetch something. She never returned and therefore he brought the baby to the police. At the meantime I had no idea this was going on and after I found out my daughter was missing, I was frantically looking for her everywhere. There were no leads and no results. After months of looking, Meng, Guangten finally told me what he did. I immediately went to the law enforcement and asked for help. It took a long time to finally locate my daughter. She was brought to Children’s Welfare Institute in Guiyang City, Guizhou province (贵阳市儿童福利院) and registered under the facility. When we got there in July 2015, it was too late. 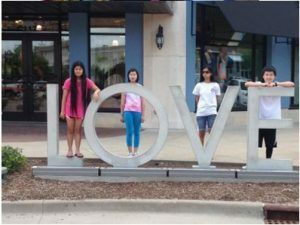 Because my daughter’s identity was unknown and nobody came to find her, she was adopted by an American family through legal channels. They told me I shouldn’t worry because she is having a good life now. For the past 15 years I have been living by myself in a remote village in China. I left Meng, Guangten and I was never able to have children again. I miss my daughter everyday. I want to know if she is ok, if she is happy. I want to see her and hear her voice. Please help me find her.